Those who know me well are aware that I’m not generally one to give praise lightly. While I read a lot of books I think are fantastic and authors who I believe have talent, not every voice or novel is one that makes a lasting impression or will likely impact future fiction. So please take me seriously when I say that I do believe Catherynne M. Valente is one of the most gifted authors writing today. Fifty years into the future, I want her Fairyland series to be a classic, read in place of or alongside the Chronicles of Narnia and Alice in Wonderland. To be, as ever, quite honest, I thought for quite a good part of the book that it was not the ending that I wanted for this series. I really should have had more faith in Valente, because the way she pulls everything together at the end is brilliant and mysterious, and basically makes me want to go read back through everything for hints and clues about what’s really going on in the Fairyland series. 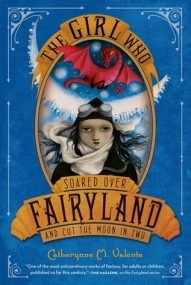 In The Girl Who Soared Over Fairyland and Cut the Moon in Two, our young heroine is no longer quite so young. She’s a teenager now. She’s learning to drive and starting to worry about what her future career will be. This journey to Fairyland will likely be her last, much like Susan and Peter were kicked out of Narnia after The Voyage of the Dawn Treader or adults cannot go to Neverland with Peter Pan. September misses Fairyland with a fierceness made stronger by her tenuous relationship with it now that she’s grown older. Even more than that, she misses herself, the young girl that she was before who had free and easy access to Fairyland. At this juncture, I am less sure that Fairyland is a metaphor. Or maybe I’m more sure. Either way, Valente purposely makes the reader question whether September’s experiences are real or imagined. Either way, Valente constantly drops truth bombs about growing up, social norms, and any number of other things. A scene in TGWSOF actually explains monetary systems and how they’re all entirely social constructs. It’s brilliant and couched in such a way as to make sense to young readers. Though I dearly love Ell and September and Saturday, I think my favorite character in the series may actually be the narrator. Any time the omniscient narrator speaks to the audience or weighs in, I revel in it. Perhaps because omniscient narrators are not often done these days and perhaps because this narrator is fantabulous. Moving to the sad part of the review, I did have a couple of issues with how this one went down. First, the pacing in TGWSOF was a bit slow. The part where September first arrives on the Moon in particular; there’s this part where she goes to the library and the librarians infodump a whole bunch of stuff over several pages that was a real slog. Second, and perhaps related, this quest really does not feel like September’s. In the other instances, September made choices that lead her to a particular place. Here, September gets into Fairyland and is then told what to do. It felt arbitrary, which increased my sense of disengagement during the slow parts. Catherynne M. Valente is nothing short of an authorial genius in my opinion, even if I didn’t find this installment to be entirely without flaws. You can bet that I will read anything she writes.